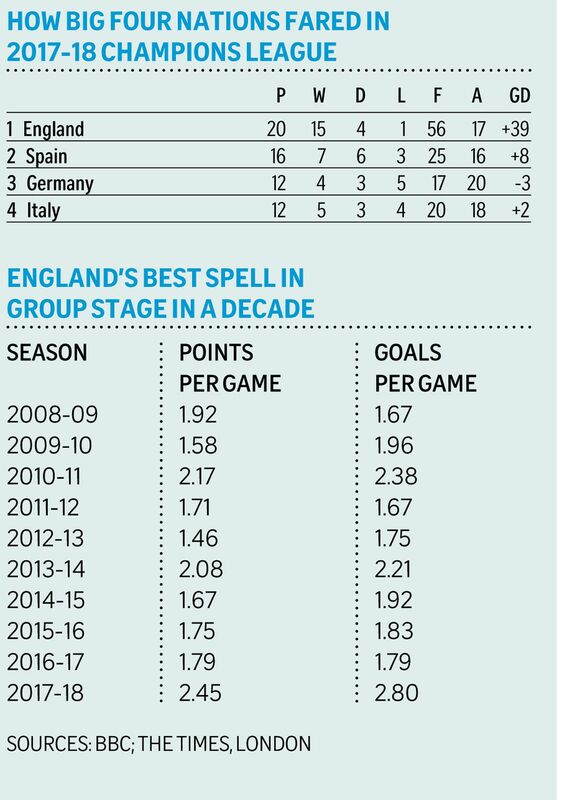 LONDON • After years of premature exits and Champions League disappointments, there is optimism that English clubs can challenge for the title this season. Two-thirds of the way into the group stage of Europe's elite club competition, Manchester City and Tottenham Hotspur have qualified; Manchester United have four wins from as many games; Liverpool top Group E; while Chelsea can still make the knockout stages. All five English clubs could reach the last 16 for the first time. Collectively, they have scored 56 goals and conceded just 17 times. Sky Sports pundit and former United defender Gary Neville believes the difference this campaign is better defending. "The reason our Champions League performances have been so poor in recent years is because our teams can't defend," he told Sky Sports. "We're now back at a point where Chelsea, Tottenham, Manchester United and Manchester City are actually doing what they should be doing. They are conceding fewer goals - a lot fewer goals." Leicester City were the English representatives to go furthest last season, when they fell in the quarter-finals to Atletico Madrid, while Chelsea were the last Premier League club to lift the Champions League trophy in 2012. The Blues' 3-0 defeat at Roma on Tuesday represents the only loss English clubs have suffered in 20 group games this term. Even though it is still early days, with the gruelling festive fixture programme and lack of a winter break yet to take their toll, the performances so far have been encouraging, particularly the wins for Spurs and City against Real Madrid and Napoli respectively on Wednesday. Spurs have made a mockery of their so-called "Group of Death", which includes 2013 runners-up Borussia Dortmund. At Wembley, they cast holders Real aside 3-1 with their pressing, pace and power, proving they have the physical and mental strength to beat the best teams in the world. In Naples, City underlined their status as genuine contenders with their most impressive victory in Europe this season. The unbeaten Serie A leaders presented Pep Guardiola's men with a huge challenge and they responded with maturity, skill and destruction to come from behind to win 4-2. Last season, the leading English clubs were in transition. Guardiola was navigating his way through the demands of his first season with City and finding it complex and demanding. United, absent from the Champions League last term, are back in the big time with Jose Mourinho, who won this competition with Porto and Inter Milan. Having bolstered his squad, the pragmatic tactician is ready to push United on to bigger things. Liverpool manager Jurgen Klopp has the reputation of someone who can take a dark horse, in the form of Dortmund, to the final, and is now at the helm of the club who have won the European Cup/Champions League five times. One could observe that the German still has defensive problems to address, or that the consistency that served Chelsea so well last season continues to elude the Blues. But every manager in charge of the five English clubs is at least in his second season and all the wiser for it. Guardiola has smartened up his defence, Mourinho has added power to his front line, while Mauricio Pochettino is reaping the benefit of putting together a side that is growing visibly in terms of confidence and experience. Chelsea legend and BBC Radio 5 Live analyst Pat Nevin told the BBC: "Last season, I felt it was the big transition period for English football and it has now happened. "Manchester City had a massive transitional season but I think they are now powers again. Tottenham were slowly and surely getting better too but English football teams are back now as the power league again."